My library finally got in some books I've been waiting to read, and I'm so excited to get started on them! Especially Embrace and Partials, which I've heard nothing but good things about. I've already read The Calling, and had to have a finished copy for my collection. I can't wait to read all of these! What's in your mailbox this week??? YAY! We need to talk about Embrace when you are done! I can't wait. Gilt!!!! I am so glad you're going to read this. Super excited to have you as part of the tour as well! My library has a super long hold for The Calling but I am looking forward to reading it soon. Great mailbox and so many of these I am excited to see your review for! I LOVE The Statistical Probability of Love at First Sight! Such a sweet and quick read! Enjoy! I have Gilt waiting for me to get a chance to read it. Being a descendant of a Boleyn sister, I can't get enough of that time period of books. Great haul, and enjoy everything! Ahh! Embrace, I really loved it :D I have Partials and really want to read it.. I just have to find time lol! All of your books look awesome! Gilt, The Calling, and The Statistical Probability of You & Me look so good! I really hope you enjoy them all! I love Gilt's cover! 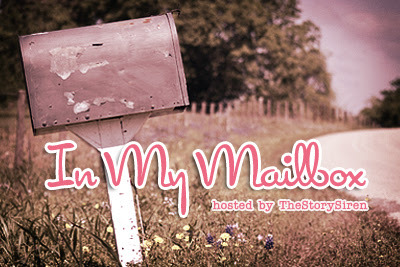 Btw, I really like your blog :D and am a new follower! So glad I found your blog, I will definitely be checking in more often! Super awesome mailbox this week! I'm dying to read every one of your books :) I'm going to the Dark Days Tour on Wednesday in Dayton, OH and I'll be getting Partials then. Can't wait to see what you think about all of them, especially Embrace! Gilt looks so pretty on your ereader! :D Statistical Probability is really cute, hope you enjoy it! OH, I am reading the Calling next---I can't wait! Stat Probability is really good and I've been meaning to check out GILT! All books you got are in my wishlist, especially Partial and Statistical. really want to read them. Can't wait to know what you think about those. I only wish our libraries had such books, we don't have much English books choices. "/ But a great haul! I started reading Partials in March and then stopped after 50 pages, it wasn't bad or anything, but I simply wasn't pulled into the story. I plan to finish it over first school vacations that come along. Nice Haul :O) I love being able to grab books from the library I can't otherwise afford. Awesome books. Hope you enjoy Embrace ;) I’m up to the third book Emblazed (Hooray for being Aussie!) but I still need to read Partials. I really want to read Partials! Here's mine: IMM . awesome!! i need to make my way over to my library and see what they have, but i have been too busy! Eeep! I loved loved loved The Statistical Probability of Love at First Sight! Hope you do, too! :) And I'm excited for you to read Embrace! I've read amazing reviews on that one. Oh All great books! I have Statistical but still havent gotten around to reading it! I started Partials but did get a chance to finish before my arc disappeared. Enjoy! love the look of every single book!!! Hope you enjoy them all!! Nice! Loved embrace and the statistical...enjoy! Embrace looks like a nice read! The Calling also has a gorgeous cover! You got some good books from the library :) My library is starting to get good books. That e-book cover of Gilt looks fabulous - makes me rethink e-books entirely! :) I've been seeing The Statistical Probability of Love at First sight for awhile now, and I've been intrigued (since I used to teach statistics previously) - t'would be interesting to see the statistical terminologies applied to love and YA fiction. Your library also has a great stack, lovely! Enjoy your reads. I really want to read GILT! I have not yet scored a copy, am hoping to soon! :) Great IMM! Every book you got this week I want! I'm waiting for my library to get a copy of Partials and Statistical Probability! I have ARC's of Embrace and Gilt and I can not wait to finally get to them. They book look amazing! I hope that you enjoy your new books! THE CALLING! I love Kelley Armstrong so much, it hurts. I got Gilt too- I can't wait to read it. It sounds really good! I also want to read Statistical Probability. I have heard such great things about it. I hope you enjoy it! awwwe, I love love loved the statistical probability.... ect. ect.. I have a borrowed copy of partials I'll be reading soon. I heard it's pretty darn good. Enjoy all your books :) Embrace was AWESOME. I need to read all the rest of the ones you got, but they all look fab. Nice haul of books! I have Gilt to read too. I need to get started on it lol. Great mailbox Christy :) !! The Statistical Probability of Love at First Sight is a great read :) !! I look forward to know what you think of Partials !! Love the books you got this week Christy! STATISTICAL is so cute! 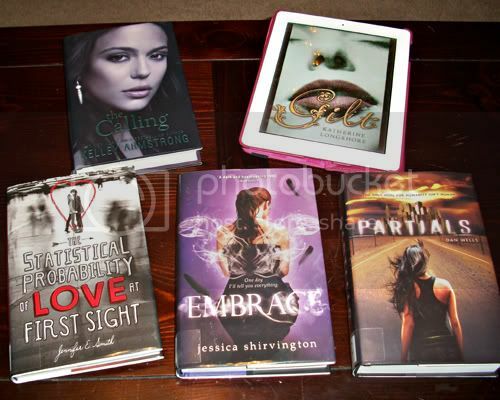 I still need to read EMBRACE and PARTIALS! *guilty look at pile* Enjoy everything! I love library books..I have..mm, two this week! the stastitical was a really nice read. I hope you'll enjoy all your new reads! Ooh, you got lucky at the library this week! I hope EVERYONE got The Calling this week. It's awesome. Great book haul! I still need to read the first book before The Calling & I really want to read The Statistical... (you know the rest) :) Oh, and I read Embrace & loved it so hopefully you will too! Happy reading! Wow!! Those are such good books. I especially want to read Statistical, Gilt, and Partials! Great set. Hope you enjoy Embrace. I really did.